Whenever I pen anything about the dangers of age verification mandates for the Internet and social networking sites, I always point to Federal Trade Commission (FTC) reports about rising identity theft complaints. 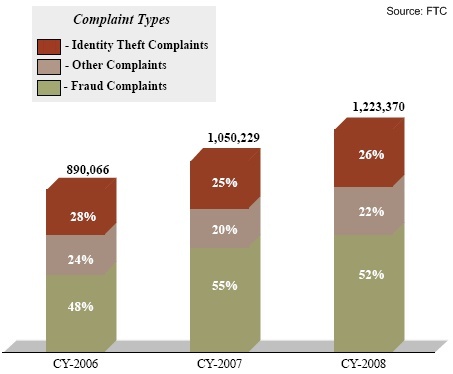 For the ninth year in a row, identity theft was the number one consumer complaint to the agency. Now, imagine how much worse this problem could get if government mandated that everyone had to be "verified" before they were allowed to visit a social networking site, however that ends up being defined. Such a mandate would exponentially increase the amount of personal information -- especially credit card information -- that was available to identity thieves. Age verification advocates often ignore this problem when making the case for regulation. Worse yet, much of the information that would be made available via such mandates would be personal information about children, which makes for a very attractive target for identity thieves since those records are rarely checked until the kids get much older and start applying for things. At least most adults typically learn they have been the victim of ID theft shortly after it occurs, allowing them to take steps to deal with the situation. With kids, their records could be milked for years by bad guys without them or their parents ever knowing it. it seems to be very difficult to verify all of the users of social networks. We have to protect our children and ourselves from thefts and frauds.